February 2016 • SMT Magazine 87 5 Inovar adds Industry expert Charlie barnhart to Its board of Directors Charlie Barnhart, a well known EMS industry in- sider, has joined inovar Inc.'s board of direc- tors. As a board mem- ber, Barnhart's primary objective will be to help Inovar grow in footprint, capabilities and service innovation. 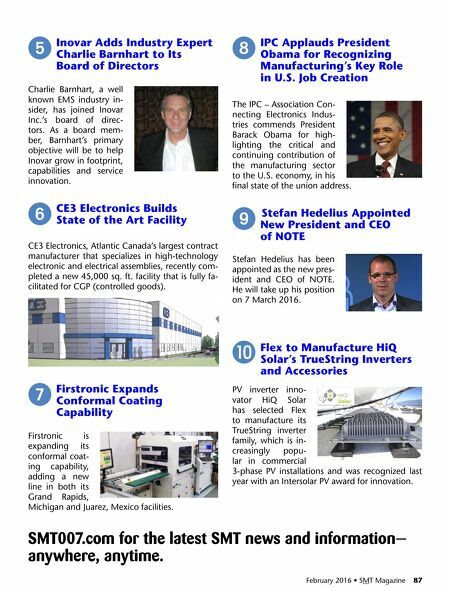 6 Ce3 electronics builds State of the art Facility CE3 Electronics, Atlantic Canada's largest contract manufacturer that specializes in high-technology electronic and electrical assemblies, recently com- pleted a new 45,000 sq. ft. facility that is fully fa- cilitated for cgp (controlled goods). 7 Firstronic expands Conformal Coating Capability Firstronic is expanding its conformal coat- ing capability, adding a new line in both its Grand Rapids, Michigan and Juarez, Mexico facilities. 8 IPC applauds President Obama for recognizing Manufacturing's Key role in u.S. Job Creation The IPC – Association Con- necting Electronics Indus- tries commends President Barack Obama for high- lighting the critical and continuing contribution of the manufacturing sector to the u.S. economy, in his final state of the union address. 9 Stefan Hedelius appointed New President and CeO of NOTe Stefan Hedelius has been appointed as the new pres- ident and CEO of NOTE. He will take up his position on 7 March 2016. J Flex to Manufacture HiQ Solar's TrueString Inverters and accessories PV inverter inno- vator HiQ Solar has selected Flex to manufacture its TrueString inverter family, which is in- creasingly popu- lar in commercial 3-phase PV installations and was recognized last year with an Intersolar PV award for innovation. 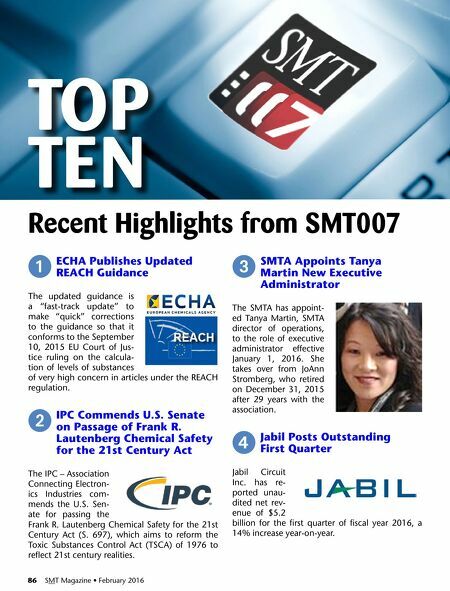 SMT007.com for the latest SMT news and information— anywhere, anytime.